HOUSTON — (February 14, 2018) — The Houston real estate market kicked off the new year in generally positive territory, with sales up, a mixed pricing performance and a stable supply of homes available to buyers in January. Overall sales of single-family homes rose 8.9 percent, according to the latest monthly report from the Houston Association of Realtors (HAR). However, January marked the third consecutive month of declining sales among luxury homes  those priced at $750,000 and above. The strongest sales performance took place among homes in the $250,000 to $500,000 range. Housing inventory was unchanged from the 3.3-months supply a year earlier, in January 2017. 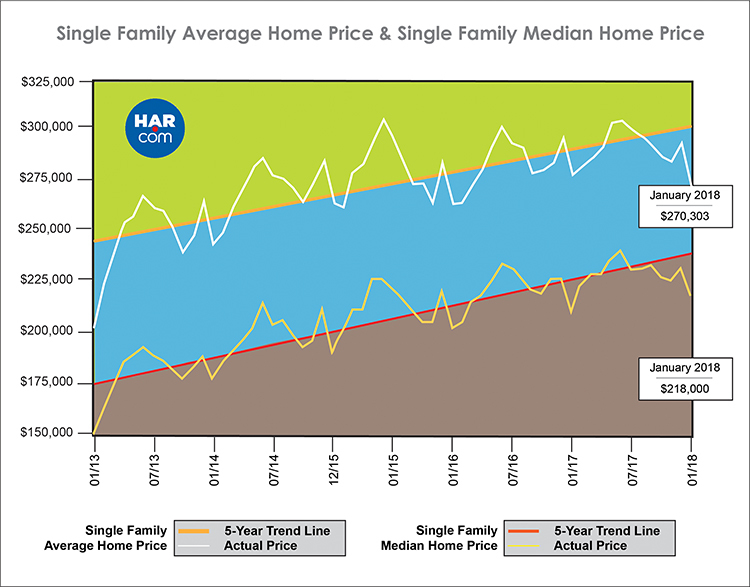 The single-family home median price (the figure at which half of the homes sold for more and half sold for less) rose 3.8 percent to $218,000  the highest median ever for a January. The average price declined 2.1 percent to $270,303. "The Houston housing market seems to have carried the positive momentum from 2017 into the new year, even with some softening in the high end," said HAR Chair Kenya Burrell-VanWormer with JP Morgan Chase. We hope to sustain that positive momentum with 28,000 new homes slated for construction this year, according to Metrostudy, as well as healthy gains in employment. In the February edition of its Economy at a Glance publication, the Greater Houston Partnership (GHP) reported the creation of 46,000 jobs across greater Houston in 2017  with more Houstonians finding employment last year than in 2016. January sales of all property types in Houston totaled 5,468, an increase of 8.7 percent versus the same month last year. Total dollar volume climbed 6.3 percent to $1.4 billion. Consumers showed different degrees of interest in lease properties across the Houston area in January. Single-family home leases rose 1.9 percent while leases of townhomes and condominiums fell 5.3 percent. The average rent for single-family homes was up 1.4 percent to $1,748 while the average rent for townhomes and condominiums edged up 1.3 percent to $1,516. Houston's monthly housing market indicators yielded mostly gains in January, with single-family home sales, total property sales, median pricing and total dollar volume all up compared to January 2017. Average price was the only measurement to decline. 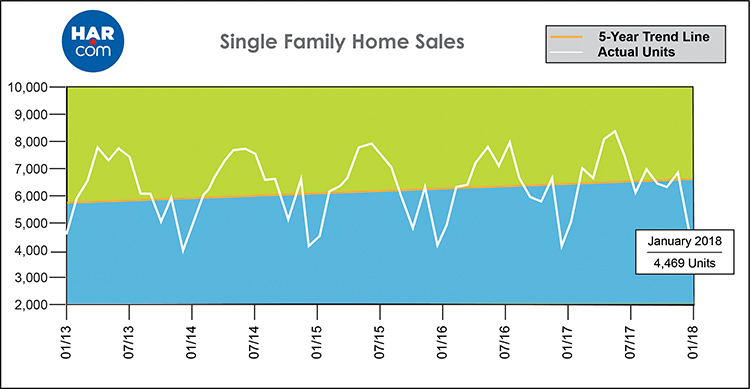 Month-end pending sales for single-family homes totaled 6,313, up 10.4 percent versus last year. Total active listings, or the total number of available properties, increased 0.4 percent to 34,080. Single-family homes inventory was flat at a 3.3-months supply. For perspective, housing inventory across the U.S. currently stands at a 3.2-months supply, according to the latest report from the National Association of Realtors (NAR). Coming off the holidays  a traditionally sluggish time of year for real estate  single-family home sales rose in January, with 4,469 units sold. That is up 8.9 percent from January 2017 when sales volume totaled 4,104. 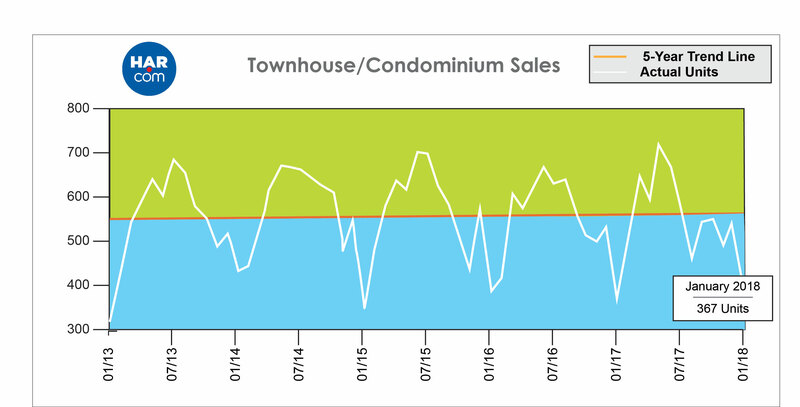 Volume of townhome/condominium leases fell 5.3 percent with average rent up 1.3 percent to $1,516.